Living in Utah, Christina VanDam developed an interest in aerial silks and fitness. When she moved to Grand Rapids about four years ago, she couldn’t find a place that supported those areas of fitness on the flexible schedule she needed. VanDam was a teacher at the time, and ended up getting laid off on maternity leave. So, her husband suggested she visit the Small Business Development Center (SBDC) at Grand Valley State University to see how she could create a space for all kinds of aerial fitness. In the spring of 2016, she created a business plan. But after having a new baby and buying a new house, the idea fell to the back burner. She went back to teaching full-time. Using the various resources for women entrepreneurs in Grand Rapids – like GROW (Grand Rapids Opportunities for Women) – VanDam started to make progress on her business idea again. Now, VanDam is full-time running her studio, Zeal Aerial Fitness. 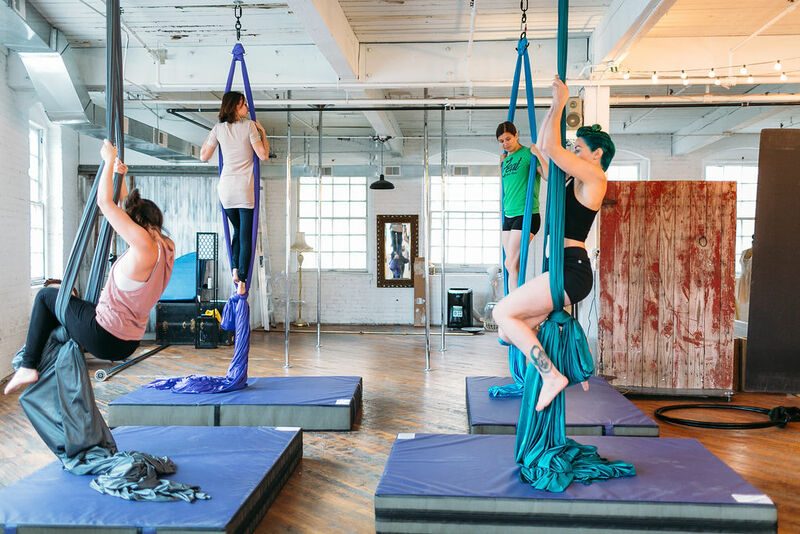 Officially opened last September, the studio offers classes in pole dancing, aerial silks, aerial hoops, hammock silks, yoga and flexibility. VanDam, who studied and taught American Sign Language, also offers “Voice Off” classes for those who are deaf or hard of hearing. VanDam chose to combine her skills to create a more inclusive setting at her studio. While it may seem simple from the outside, starting a business was no easy feat. VanDam said one of the biggest obstacles is starting, and starting small. “Of course, I just had this idea of what this gym could be, and so figuring out how, realistically, I can start small,” VanDam said. For example, right now Zeal Aerial Fitness shares studio space with a handful of photographers. In the future, VanDam’s goal is to have her own studio, but she can still start her business now, just on a smaller scale. “It was hard to take your dream and scale it back, being realistic to start,” she said. VanDam and others practice with aerial silks. Another struggle, she said, has been educating people on what her gym offers. VanDam said, with all the struggles, the best help she got was through entrepreneur programs, like Spring GR, Start Garden, GROW and the SBDC. To learn more about Zeal Aerial Fitness, visit www.zealaerialfitness.com. VanDam and others practicing aerial silks.